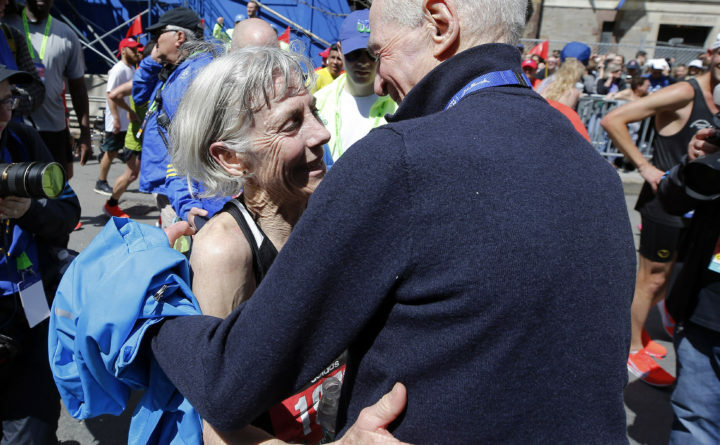 Joan Benoit Samuelson, first women's Olympics marathon winner, is embraced after finishing the 123rd Boston Marathon on Monday, April 15, 2019, in Boston. The Cape Elizabeth native and Freeport resident met her stated goal of finishing the 2019 race within 40 minutes of her winning time in 1979, completing the 26.2-mile trek from Hopkinton to downtown Boston in an even 3 hours, 4 minutes while running much of the marathon with her daughter Abby. Samuelson, who was wearing a Bowdoin College racing singlet and a Boston Red Sox hat — just as she did during the 1979 race — averaged 7 minutes, 1 second per mile along the route. Wearing bib No. 1979, she reached the 13.1-mile midpoint in 1:29:55 and nearly maintained that pace the rest of the way by running the second half in 1:34:05. Robert Ashby of Brunswick and Meg Brockett of Portland were the top Maine finishers in the men’s and women’s divisions, respectively. Ashby, a 50-year-old Eastport native, placed 293rd overall with his time of 2:38.23 for a per-mile pace of 6:03. Ashby ran nearly equal splits while placing third in the men’s 50-54 age division. He ran the first half-marathon in 1:18:44 and came home in 1:19:39. Evan Graves, 37, of Caribou finished second among the Maine men’s contingent in 2:44:20. Julian Gazzelloni, 27, of Belgrade was third in 2:44.52. Brockett, 23, finished 54th overall in the women’s field in 2:46:54. She completed the first half-marathon in 1:20:43 and the second half in 1:26:11. She ran at a 6:22 per mile pace. The lone Maine women’s runner to start in the elite field, Sarah Mulcahy of Fort Kent, completed the race in 3:22:55. The 33-year-old Mulcahy, a math teacher at Fort Kent Community High School who last December qualified for the 2020 U.S. Olympic Marathon Trials with a personal-best time of 2:44:28, did not expect to challenge that time at Boston in great part because of harsh winter weather conditions that hampered her training for the event, along with a calf injury that further slowed her preparation. Samuelson was a 21-year-old Bowdoin College student in 1979 when she set an American marathon record and a women’s course record at Boston. She won Boston again in 1983 with a world best at the time of 2:22:43. A year later, Samuelson won the first Olympic women’s marathon at the 1984 Los Angeles Games. Samuelson last ran the Boston Marathon in 2015 and finished in 2:54:03. She was the champion of the women’s veterans (ages 50-59) division at the 2011, 2013 and 2014 Boston Marathons, setting a veterans record of 2:50:29 in 2013. Her most recent marathon before Boston was at last October’s Bank of America Chicago Marathon, where she was timed in 3:12:13. Samuelson finished behind her daughter at Chicago but turned in the faster time at Boston. Abby Samuelson, 31, of Portland, Oregon, finished in 3:10.28. On Saturday, North Yarmouth native Ben True finished second in the Boston Athletic Association 5K. The 33-year-old former Greely High School and Dartmouth College standout, who now lives in West Lebanon, New Hampshire, was clocked in 13:44, only two seconds behind race winner Francisco Sanclemente of Colombia. Monicah Ngige of Kenya took the women’s 5K title in 15:16.